Coral Springs, Florida, was named #78 in MONEY's 2008 "List of America's Best Small Cities", #27 in MONEY's 2006 "Best Cities in the United States in Which to Live", "10th Safest City in the US" by MORGAN QUITNO in 2007, and "One of the 200 Best Communities for Kids" by AMERICA'S PROMISE in 2007. 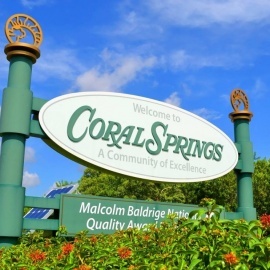 With credentials like the above, and the fact that it is located on Florida's southern Atlantic coast only 20 miles northwest of Fort Lauderdale, Coral Springs (chartered in 1963 as a "planned city") appeals to both future residents and visitors. The "Our Town" annual festival since 1979 features a beauty pageant, car show, carnival rides, and more. "The Walk", an open-air entertainment and shopping center, is a main feature of downtown, which area is being redeveloped at a cost of approximately $700 million. The Sportsplex at Coral Springs features twin ice rinks, an Aquatic Complex, a Tennis Center, Dog Park, the Sawgrass Nature Center and Wildlife Hospital, etc. ; and the city also has over 50 parks. The Coral Springs Center for the Arts includes a 1,471 seat theater which has popular shows and a yearly Broadway series. There is also an 8,000 square foot Museum of Art. A covered bridge was built in 1964 to promote the town. Coral Springs's stringent building codes were designed to retain the aesthetic appeal, and a 12 story condominium is the tallest building in the city with only five other buildings of 10 stories each. There are strict restrictions on landscaping, commercial signs, exterior paint colors, etc. Join Author, Carol Lynne Smith as she launches her newest book. Join us at 3 p.m. on Saturday, May 11, 2019 where you can design and create your very own Russian Stacking Doll project. Artfull Saturdays are a great way for children and a parent or guardian to explore the museum and spend a fun afternoon together. Join us at 3 p.m. on Saturday, June 8, 2019 where you can design and create your very own Arabic Tile Mosaic project. Artfull Saturdays are a great way for children and a parent or guardian to explore the museum and spend a fun afternoon together. We are excited to present the 2019 Made4Muzic Concert Band Camp! A Tribute to the greatest Southern Rock bands ever created.